Do you think you made a mistake with the impeachment motion? What is that you have achieved? Whenever you want to do the right thing there is no question of a mistake. You are appealing to the court, but there are now question marks over who should hear this appeal. Because, obviously the chief justice cannot. And, nor can the four judges who went public with their anguish. Because, they raised issues about the functioning of the CJI. So, they cannot be considered neutral. This is supposed to be about the powers of the chairman [of the Rajya Sabha]. Please understand. When you go to the Supreme Court, which judge will determine it? The four judges are not interested in the matter because the issue before the court will have nothing to do with the merits [of the impeachment petition]. Those merits will be decided in the enquiry, after the motion is admitted. So, you are appealing to say, let there be an inquiry ordered, under the chairman of Rajya Sabha? I am appealing that at this stage, the chairman has no constitutional right to dismiss a motion. And, that the parameters for dismissing a motion are very limited. These are: One, have 50 members signed? Two, is the motion consistent with Article 124? And three, do the charges have anything to do with misbehaviour? If these parameters are satisfied, he cannot dismiss it. Kapil Sibal is a Congress leader and Supreme Court lawyer. He was additional solicitor general and president of Supreme Court Bar Association. He headed different ministries in the UPA governments. Currently, he is a Rajya Sabha MP from Uttar Pradesh. I think that you are under a misconception. The chairman has no quasi-judicial authority to decide on merits. It is the enquiry committee which will decide. Their report will find whether the allegations have been proved or not. If the allegations are proved, then the motion will come back and there will be an address to the president of India on the basis of ‘proven misbehavior’. So, proven misbehavior happens at the stage after the enquiry is complete. If we have to show it at this stage, there is no need for an enquiry. Now, you say, we have used words—’appear’ and ‘may’. Now, ‘appear’ is in the context of an order which appears to have been antedated. Then, there is the word ‘may’, in the issue of conspiracy involving corruption in admission to medical colleges. In that matter, one judge is being prosecuted—a sitting judge in the High Court [Justice Narayan Shukla] in Allahabad. Then there is an Odisha retired judge, who was involved in it. And, these matters have been dealt with in court number 1. And, CBI has gone into a lot of evidence. CBI also sought the sanction of the chief justice to arrest the man. So, we do not want to go into all that. We say that there appears to be a larger conspiracy. Both are very well-coined words and expressions which should be used, and no other expression should be used. But, apart from all this, there are other allegations of matters being sent to particular judges, which were expressed by the four judges of the Supreme Court themselves. And, if four judges, on January 12, said that they felt that democracy was in peril, then obviously they know what is happening inside the court. But, should that fight not have been led by those four judges as it is the internal matter of the court? What is an internal matter? Judicial misbehavior is an internal matter of the court? They expressed their anguish at the manner in which the court was being administered. But, they cannot do anything more. They cannot take the battle forward, and they should not. But, imagine, what must have troubled them—coming out in the public for the first time in the history of our country. How do you respond to Arun Jaitley who called this a revenge petition? That is real politics. How can it ever be revenge? Against whom? Against judgments that did not go your way. How? We never knew about the Loya verdict when the petition was signed one month ago by several members. In fact, my worry is a little more. They probably knew that we were meeting the vice president on April 20. It is very surprising. One month ago we signed [the motion]. One week before [the verdict], we seek appointment from the vice president and he gives us time on the 20th. We do not know then that the Loya judgment is coming on the 19th. So, it is very irresponsible for any minister to say that it is revenge politics. Why do you want to prevent the enquiry? Why do you want this judge to retire with a pall of suspicion over his head? But, should that determination be made by politicians? I ask this because you are on record in the past, where you argue the exact opposite—that politicians should not determine the future of judges. The problem with journalists is that you do not read the entire statement. The question was in the context of a motion which is voted upon in the Parliament. I said, and I stand by it, that this procedure makes a mockery of everything. Why? Because, there is a silent whip issued. So, even if the charges are proved, the whip is issued by a party on how to vote. So, it is a mockery. This whip cannot be issued, for the reason that when you are deciding on a motion for the removal of a judge, you are a judge yourself. 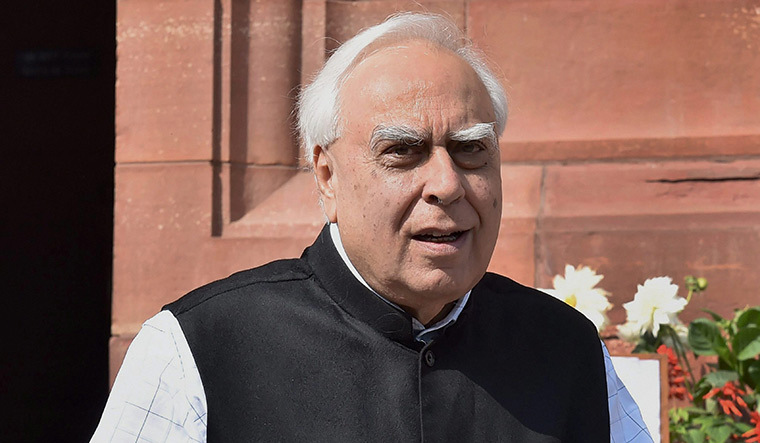 There has also been a suggestion by BJP leaders that Kapil Sibal was, in particular, concerned about the impending Ayodhya judgment. The fact that you had a disagreement with the chief justice of India and you wanted the case postponed till after 2019 is in the public domain. Harish Salve has spoken about how you threatened to walk out of court at one point. So, some see the Ayodhya verdict by the chief justice to be the motive for your impeachment move. Why are they so sure that the Ayodhya judgment will be in their favour? But, it is known that you had a run-in with the chief justice in this matter. That is because of the procedure. It has nothing to do with the hearing. He said, you start today—a case where records runs into 20,000 pages. We said we cannot start today. Who can prepare 20,000 pages? He said, ‘No, you must argue today.’ We said we cannot, and, if this is the way we are going to proceed, we are not going to proceed. It has nothing to do with the merits of the case. It could be a pressure tactic to make the chief justice feel he is under political scrutiny, and that any judgment that is delivered from his court will be subjected to political scrutiny. Has anybody asked for an adjournment in the Ram Janmabhoomi case? Has any party asked for adjournment? And, which political party is a petitioner in that case? No political party.... And, if I had made a statement, it is in my capacity as a professional, in the context of the interest of the country. But, after that, nobody has sought an adjournment. What did you hope to achieve with this impeachment, knowing that you did not have the numbers? One, you must shake the system for something to happen. We stand for a transparent judiciary, where judges are accountable and this is a process of accountability. And, if there is an enquiry, we believe that these charges will be proved. And, once the charges are proved, this government will be deeply embarrassed. Are you concerned that even critics of this government and independent voices have not supported this impeachment? Like eminent jurists Fali Nariman and Soli Sorabjee. Soli Sorabjee has never spoken in his life for the Congress party, so let us leave him out. As far as Fali Nariman is concerned, he says because the CJI’s remaining tenure has only a few months left—‘let’s lump it’. We do not agree with that. Please ask Mr Nariman, what [is] the solution? The people of India must be told what is happening in this court. What they expect of citizens, we expect of the judges.